Seitkazy Mataeva at the Forum of European and Asian Media, Moscow, 2009. (с) Ruslan Krivobok / RIA Novosti. All rights reserved.These days, there’s no shortage of worrying news reports on the repression of activists and independent journalists in Kazakhstan. If current trends continue, we can expect many more — a full chronicle of the destruction of freedom of speech in our country would require an article in itself. 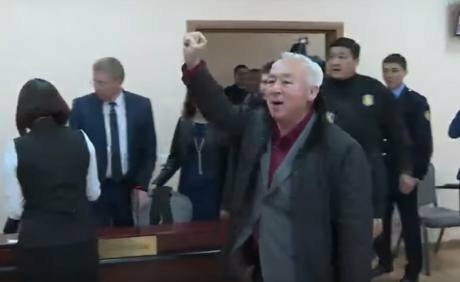 The case against Seitkazy Mataev and his son Aset sums up the contempt for freedom and legal rights which have characterised Kazakhstan’s politics since independence. 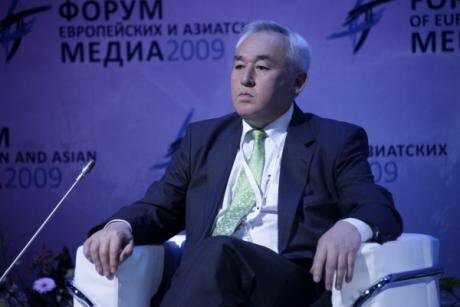 As the director of the popular KazTag news agency and chairman of the country’s Union of Journalists and National Press Club, Seitkazy Mataev is a high-profile figure. In February, Seitkazy and Aset were charged with tax evasion and embezzling funds from their organisations’ budgets. During the trial, the defence presented reams of legal documentation and materials published by KazTag as part of a state contract. The court was provided with 30 volumes of financial records, collected by an independent auditor, attesting to the legality of the Mataevs’ business practices. Neither the police investigators, prosecutors nor the court bothered to review these materials. All the papers are there — proof of work undertaken and payments made, undersigned by officials at the Ministry of Information and KazakhTelekom. Nevertheless, employees of these organisations are under pressure from the financial crimes unit to accuse the Mataevs of crimes they did not commit. In fact, KazTag and the National Press Club have been awarded state tenders for over five years — yet this is the first time we’ve heard of any wrongdoing. The case against the Mataevs has, understandably caused quite a stir. Public figures, journalists, legal experts in Kazakhstan and abroad came to his defence, as did European human rights defenders and voices in international media. The trial continued, and the verdict was given. On 4 October, the court found Seitkazy Mataev guilty of fraud and tax evasion, sentencing him to six years’ imprisonment with confiscation of property. His son Aset was also found guilty of fraud, and was handed five years and confiscation of property. It should be stressed that Mataev senior, who is 62 years old, suffers from serious health problems. On several occasions throughout the hearings, he needed urgent medical assistance. There’s a strong likelihood that he will not survive his incarceration. With these words in mind, the sentencing of the Mataevs is proof that in Kazakhstan today, you don’t need to be a strident member of the opposition in order to go behind bars. It’s enough to be an honest and free-thinking individual. On Friday, Kazakhstan’s supreme court rejected an the appeal against the verdict. There was one silver lining: instead of the initial lifelong ban on holding leading positions in “commercial or public organisations”, the Mataevs are instead forbidden from occupying “executive or materially responsible positions” for 10 years. To understand what’s happened to the Mataevs, we need to understand Kazakhstan’s current political realities. They say that “every century has its middle ages”. But this dark age appears to have lasted for all of Kazakhstan’s modern history. In recent years, that history has seen a relentless struggle by the authorities to crush any form of dissent — including independent media. Over several years, this ruthless war has been waged consistently, methodically, and on several fronts. Firstly, legislation regulating the media sphere has taken on an utterly repressive character. Luckily for the authorities, Kazakhstan has a pliant parliament which answers to the government’s beck and call. There are no genuine opposition politicians among its ranks. The reality is that the current laws regulating media not only limit freedom of speech, but present a real and immediate danger to every journalist who dares to cross the thin red line. This is true if they critically report on the activities of the authorities in general, or on particular officials. In recent months, Kazakhstan’s authorities have found another justification for intensifying their crackdown on media. They’ve often hidden behind the need to “combat extremism and terrorism”, a slogan which has come in handy given falling living standards and protests on the rise. Similarly, a poorly thought-out land reform prompted peaceful protests in cities across the country. Last month, activists Max Bokaev and Talgat Ayan were sentenced to five years each for participating one such event in Atyrau, Kazakhstan’s “oil capital” in the west of the country. Their case shows that apart from jailing activists, the authorities haven’t any solutions to these pressing economic and social problems. 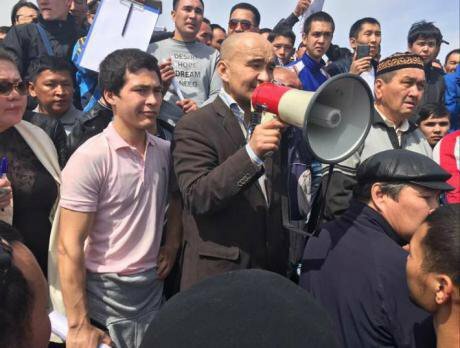 Talgat Ayan at a land reform protest in Atyrau. Source: Facebook. In an atmosphere ripe for protest, independent media outlets and civic organisations prove their value to society at large — to the great irritation of the authorities. Secondly, in any authoritarian society, laws are one thing, and their implementation is quite another. Thanks to legislative loopholes, the authorities are trying to tame the media even more — either with the carrot or with the stick. The authorities already have plenty of leverage over the media, including administrative resources. This pressure can be informal, and editors make it public at their own peril. Meanwhile, the rewards for those who play along have become more enticing. These can be as simple as a lucrative offer to purchase a media outlet, or they can be the fruits of hidden forms of cooperation, well-hidden from the public eye. Editors who refuse to submit to all forms of censorship find the sword of Damocles hanging above their heads. Finally, the powers that be have also learnt from past mistakes, including political ones. Inconvenient media outlets once faced criminal cases for overtly political reasons (such as for “insulting the honour and dignity of the president”). Nowadays, these troublemakers can be shut down for entirely banal reasons: they could find some everyman, for example, who could bring a case against the publication for offending his honour and dignity. And on it goes. Given that the president personally appoints judges at all levels, it doesn’t take a genius to work out whose side the court was on. But some choose to mince their words about this, saying that the authorities are irrelevant here, and that the dispute is between, say, a media outlet and one particular individual. This attitude isn’t rare — indeed, many independent media organisations have experienced it themselves. Due to a sense of inertia or perhaps plain ignorance, these independent organisations are frequently called “oppositional”, simply because they practice robust, honest criticism of the authorities. For example, Tribuna, a popular independent publication, was also compelled to pay immense fines after a claim raised by one government-affiliated individual who accused the newspaper of libel. Once again, the court did not take the journalists’ arguments into account. The intimidation is ongoing — this week, chief editor Zhanbolat Mamay’s car was vandalised next to his front door. Observers believe this attack was connected not simply with critical articles published in the newspaper, but with its initiative to call Bokaev and Ayan “national heroes”. The well-known journalist Rysbek Sarsenbayuly also notes a growing tendency towards intimidation. Sarsenbayuly is editor-in-chief of Zhas Alash, an acclaimed Kazakh-language newspaper founded nearly 100 years ago. The publication was hit with a fine of 40m tenge (£95,500) for apparently insulting the honour and dignity of one citizen of Kazakhstan, a businessman trading in pharmaceuticals. It was clear to everybody that Zhas Alash had been targeted due to its independent position. 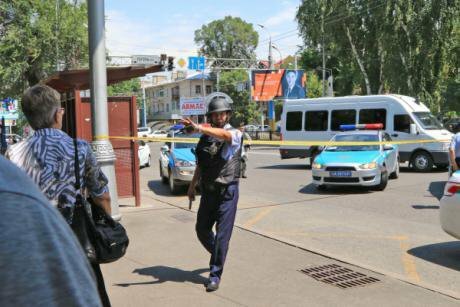 18 July: after five people were killed in the centre of Almaty, TV stations underwent a self-imposed blackout to control the government narrative. (c) Anatoly Ustinenko / RIA Novosti. All rights reserved.In this sense, the Mataevs were faced with a quintessential case of cynical “bureaucratic creativity”. Seitkazy Mataev is one of the country’s most authoritative journalists and always defended independent media and critics of the government. Dealing with him meant the authorities used not only familiar methods, but new innovations, too. This concerned Kazakhstan’s “state tender”, by which the government doles out part of its budget to fund its information and media networks. Of course, there are plenty of opportunities for officials to creatively interpret the process of granting tenders — what the resulting funds are spent on, and whether they’ve been put to good use. Essentially, the Mataevs have been found guilty of carrying out a state contract. At the same time, government officials publicly recognise the imperfections in the mechanisms by which state contracts are awarded, and even intend to amend legislation concerning it. The court’s bias against the Mataevs was visible to the most impartial of observers. As such, developments were followed with interest across Kazakhstan and abroad. Importantly, both the Mataevs and their lawyers filed some 60 petitions to the Astana court’s appeals panel. All of these were rejected without any basis during the course of legal proceedings. Among other things, these petitions demand careful, forensic examination of all physical evidence available, such as documents pertaining to KazTag and the National Press Club. It also calls on the court to recognise that important evidence stored by the prosecutor remains inaccessible, and that certain forensic examinations be declared inadmissable due to the experts’s lack of qualifications. The Mataevs’ prosecutors stressed the case against them was not political, and had no bearing on freedom of speech whatsoever. This is a bizarre claim to make for a man who founded the National Press Club and heads the country’s Union of Journalists. Under Mataev’s leadership, the press club became a space for open discussion between the authorities and media. He also resurrected the former KazTag news agency, transforming it into one of the country’s most popular and successful media outlets. Seitkazy Mataev is truly a public person, who has always stood up in defence of the fundamental principle of freedom of speech. In his own way, he was a bridge between society and the authorities, a moderator of a dialogue so necessary in today’s Kazakhstan. Seitkazy Mataev. 4 October 2016. Source: Youtube / Azattyq.Powerful private interests may also be playing a role behind the scenes. Everybody in Kazakhstan is waiting with bated breath to see what will happen once 76-year old president Nursultan Nazarbayev passes away. Various clans and influential groups in the government are already jockeying for interest, the better to seize control of the situation once “Operation Successor” begins. They’re collecting administrative resources, such as financial assets and control of key businesses. They’re putting their own people in influential positions — and they’re making sure the media is on side. Seitkazy Mataev may have fallen victim to their intrigues. According to Zhovtis, the current political system in Kazakhstan is one of clientelism and patronage. Against the backdrop of a deteriorating economy and the beginning of a transition to the post-Nazarbayev period, he is convinced that a struggle has broken out among the elite. As influential players weaken or strengthen their position, that has a knock-on effect to all of those who benefit from their protection. “Whatever Seitkazy Mataev and his son are accused of, the criminal case against them primarily reflects this intra-elite struggle,” concludes Zhovtis. A good example is that of the journalist Bigeldi Gabdullin, who was detained on 15 November. After Gabdullin’s departure from the opposition and making amends with the president, he successfully worked his way into influential circles close to the government and pro-government media. Gabdullin too is accused of fraud on a mass scale — and his approach was to address a letter personally to Nazarbayev, pleading that he be released from detention. Next year, Astana will host the international EXPO-2017 forum, which is dedicated to renewable energy policies. The government has spared no efforts in inviting high-profile guests from across the world. How might officials respond to their questions about the fate of the head of the Union of Journalists? What if they’re interested in meeting him? These aren’t impossible scenarios — after all, Seitkazy Mataev is recognised and respected by many of his colleagues in journalism overseas. In its most recent report on internet freedoms across the world, Freedom House (FH) ranked Kazakhstan 50 out of 65 countries surveyed — a drop from last year. Internet freedom in the country received 63 of 100 points (where zero indicates “free” and 100 a “not free” status). Meanwhile, FH’s latest freedom of the press report gave Kazakhstan 84 points. Both scores have dropped since last year — it seems likely to me that the case against the Mataevs played a part. There’s another journalist in the Mataev family, too. Bayan Ramzanova, Seitkazy’s wife and Aset’s mother, is a famous Kazakhstani journalist who has worked in many national media outlets and in the parliamentary press service. She’s since become a civic activist, raising awareness of the case cooked up against her husband and son. All I can do is end with these words, from Seitkazy’s wife. I have nothing to add to them.